In this photo provided by Santa Barbara County Fire Department, a flash flood area sign is posted, as evacuations have been issued for several fire-ravaged communities in Santa Barbara, California, Jan. 8, 2018. Storms brought rain to California on Monday and increased the risk of mudslides in fire-ravaged communities, driving property owners to stack sandbags in devastated northern wine country areas and leading authorities to order evacuations for Southern California neighborhoods below hillsides burned by the state's largest wildfire in history. Forecasters issued a flash flood watch for parts for Sonoma and Mendocino counties north of San Francisco, warning that heavy rainfall could trigger mudslides in areas devastated by October wildfires. The blazes leveled entire neighborhoods, killing 44 people and destroying more than 8,900 homes and other buildings. "City crews are actively driving around looking for signs of any flooding, mudslides, things of that nature. They are making sure water is flowing, making sure debris clogging storm drains or gutters is cleared up," said Santa Rosa Assistant Fire Marshal Paul Lowenthal, who encouraged residents near burned areas to have evacuation plans in case they need to flee. "The fire damaged a significant amount of trees and although a lot of the trees have been cut down and removed, there are still a lot of trees that could be a concern," he said. A yearslong drought eased in California last spring, but Northern California had a dry start to winter and hardly any measurable rain fell in the south over the past six months. The extremely dry conditions and high winds last year led to some of the most destructive blazes on both ends of the state. 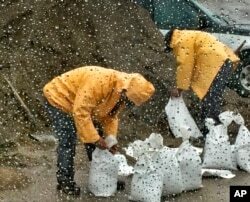 In this photo taken through a glass window, released by Santa Barbara County Fire Department, people fill up sandbags under the rain in Santa Barbara, California, Jan. 8, 2018. "Everything is soaking into the ground at this time, but if it gets very heavy, it could trigger a flash flood warning," Anderson said. In Southern California, about 21,000 people were evacuated from neighborhoods beneath hillsides laid bare by the state's largest wildfire and other recent blazes amid fears of flash floods and debris flows. Robert Lewin, director of the Santa Barbara County Office of Emergency Management, urged residents in parts of Summerland, Carpinteria and Montecito to leave by midday. The hillside communities were evacuated last month as the massive Thomas Fire raged. Evacuations also include homes near other burn areas dating to 2016. "Creeks that normally would be dry would turn into raging rivers of mud and debris and large rocks and trees," Lewin said. "These can be quite damaging. They'll destroy roads, they'll take out homes." The wet and windy system moving ashore could soak much of the state and drop several inches in parts of Santa Barbara and Ventura counties, where the biggest California blaze has burned for more than a month. About an inch of rain is forecast for downtown Los Angeles, the most in nearly a year. In the foothills just northeast of Los Angeles, residents placed sandbags outside houses that survived a December fire that scorched more than 24 square (62 square kilometers) miles, destroyed 60 homes and damaged 55 others. "I'm on adrenaline right now. I was for a whole week during the fires, and this is just as — it's a similar feeling," Kat Pierson told KCAL-TV of Los Angeles. Three canyons in that area were later ordered evacuated and suburban Burbank issued a voluntary evacuation warning for the area of a September wildfire. As the storm moved in early Monday, it snarled traffic in the San Francisco Bay Area during the morning commute and caused several crashes. No injuries were reported. The weather service also issued a winter weather advisory for portions of the Sierra Nevada above 7,000 feet (2,134 meters), forecasting about 4 to 7 inches (10 to 18 centimeters) of snow and up to 1 to 2 feet (30 to 61 centimeters) on higher peaks Tuesday. It said travelers should prepare for difficult travel conditions, including gusty winds, low visibility and slick and snow-covered roads. Warming Arctic, Drier Regions, and Wildfires: Is There a Link?